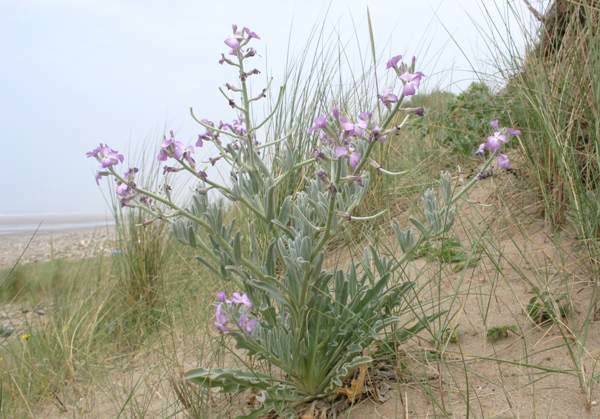 Flowers of Sea Stock have four pale-lilac petals, which have a very faint scent (difficult to detect in typically breezy coastal conditions!). Seedpods are up to 12cm long when fully developed, and they are slightly curved. The grey-green leaves and stems are coverered with thick grey down. Plants in reasonably sheltered sites can grow to a height of 30cm, but often they are spreading in form and rather broader than they are tall. More common in southern Europe, in Britain the main stronghold of this rather rare wildflower in the costal strip of south Wales. Not surprisingly this plant is also found in the Channel Islands. Elsewhere in Britain Sea Stock is now very rare indeed. Sandy shingle just in front of the first line of vegetated dunes is where Sea Stock is most often seen in Britain. Further south in Europe this lovely coastal wildflower can sometimes be found further inland from the litoral line. 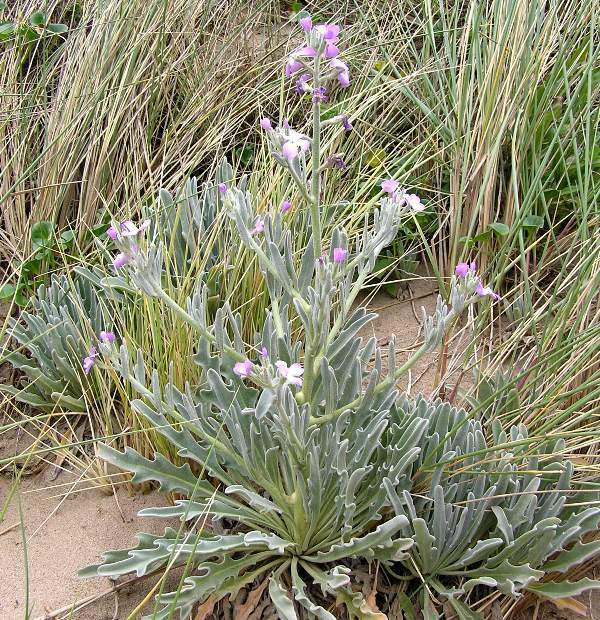 In Britain this plant flowers from June to August, while further south in Europe it blooms earlier - we see it flowering in March and April on the Algarve Coast, for example. The genus name Matthiola honours Pierandrea Mattioli, a 16th century Italian physician and botanist, while the specific epithet sinuata comes from Latin and means 'with a wavy margin' and refers to the wrinkly-edged basal leaves. 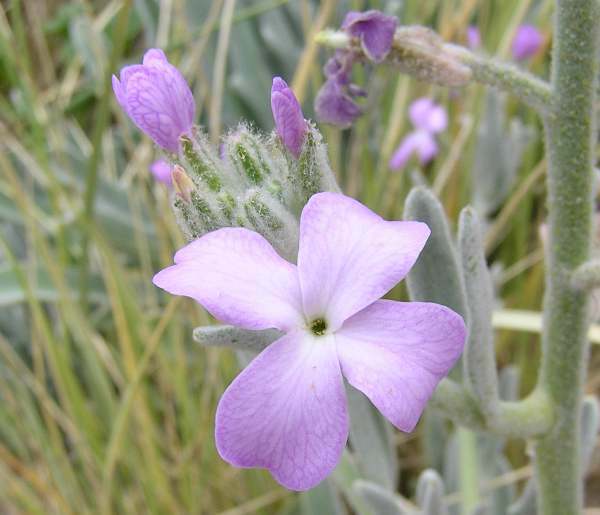 Three-horned Stock Matthiola tricuspidata is a rarer Mediterranean species distinguished by the shape of its seedpods. The Sea Stock pictures shown on this page were taken in Wales, UK.